Technology is not just changing the way you manage productivity and efficiency. It’s also driving big gains in site safety—when it’s deployed effectively. Take a minute to learn how contractors, aggregates producers and other equipment owners are using Cat® Connect Technology to enhance safety and manage risk.Cat Detect for Personnel: Defend the Danger Zone. It’s never been easy to prevent contact between equipment and people on the ground. But now there’s technology that can add a layer of protection to your existing safety processes. 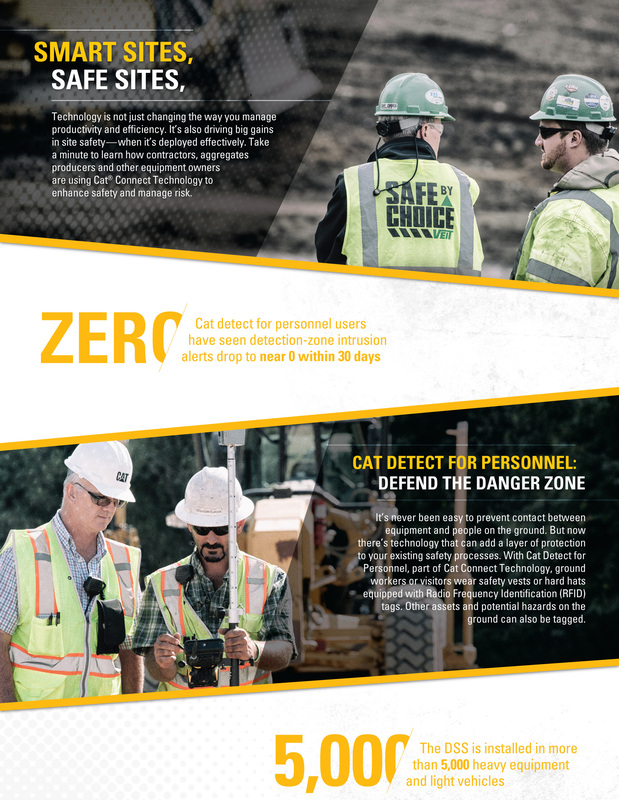 With Cat Detect for Personnel, part of Cat Connect Technology, ground workers or visitors wear safety vests or hard hats equipped with Radio Frequency Identification (RFID) tags. Other assets and potential hazards on the ground can also be tagged. When an antennae installed in the cab detects an RFID tag inside a pre-set zone, both the operator and the ground worker receive alerts. The machine’s telematics system (for example, Product Link™) captures data about the incident. The data is available for review and analysis through VisionLink®, giving site managers convenient access to critical information for decision-making.Equipment owners using this technology say it’s easy to install and customize. They appreciate its accuracy—no false alarms—and its reliable, low-maintenance design. They’re also quick to note that no technology can substitute for good safety practices. This system simply provides an additional measure of protection for people and assets. Driver Safety System: Manage Fatigue and Distraction. Fatigued or distracted operators can make mistakes that have devastating consequences. But even if your company never experiences an incident that involves major injuries or loss of life, distraction and fatigue can lead to accidents, equipment abuse and property damage. Productivity and component life may also decline. 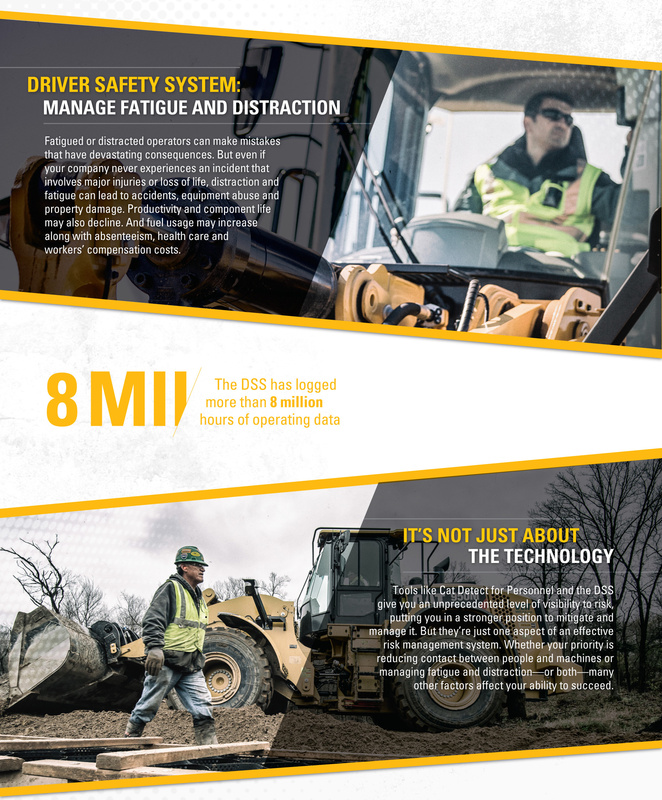 And fuel usage may increase along with absenteeism, health care and workers’ compensation costs.Tools like the Driver Safety System (DSS), part of Cat Connect Technology, can help mitigate fatigue and distraction risk. The DSS uses infrared cameras and sensors mounted in the cab to continuously measure operator eye and eyelid behavior. These measurements identify operators who are fatigued, dozing off or looking away from the task at hand for an extended period of time. Should an event occur, the operator is notified with a rumble in the seat, voice command or alarm. Notification is also sent to a central location where data can be aggregated and analyzed. An intervention plan is critical to ensure quick, consistent follow-up with fatigued or distracted operators.DSS users like this technology because it requires no operator input and is intelligent enough to differentiate between normal situations (long blinks or mirror checks) and unsafe events (nodding off or texting). 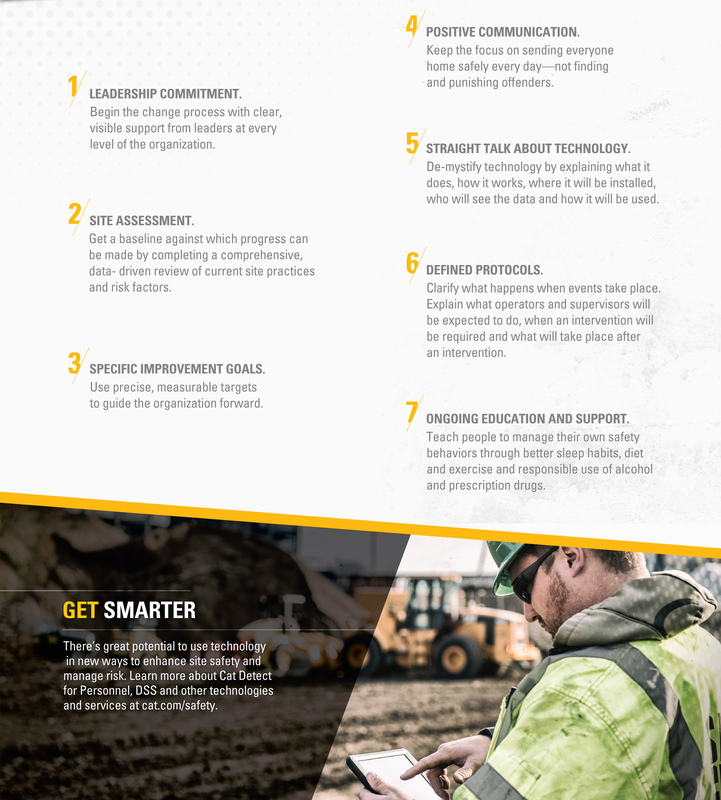 Tools like Cat Detect for Personnel and the DSS give you an unprecedented level of visibility to risk, putting you in a stronger position to mitigate and manage it. But they’re just one aspect of an effective risk management system. Whether your priority is reducing contact between people and machines or managing fatigue and distraction—or both—many other factors affect your ability to succeed. • Leadership commitment. Begin the change process with clear, visible support from leaders at every level of the organization. • Site assessment. Get a baseline against which progress can be made by completing a comprehensive, data-driven review of current site practices and risk factors. • Specific improvement goals. Use precise, measurable targets to guide the organization forward. • Positive communication. Keep the focus on sending everyone home safely every day—not finding and punishing offenders. • Straight talk about technology. De-mystify technology by explaining what it does, how it works, where it will be installed, who will see the data and how it will be used. • Defined protocols. Clarify what happens when events take place. Explain what operators and supervisors will be expected to do, when an intervention will be required and what will take place after an intervention. • Ongoing education and support. Teach people to manage their own safety behaviors through better sleep habits, diet and exercise and responsible use of alcohol and prescription drugs. There’s great potential to use technology in new ways to enhance site safety and manage risk. Learn more about Cat Detect for Personnel, DSS and other technologies and services at cat.com/safety.